Times keep changing and so do trends! While that heavily embroidered, typical lehenga-choli set was the norm at every Indian wedding, it’s really not the case now. Tbh, even brides themselves choose to go minimal! 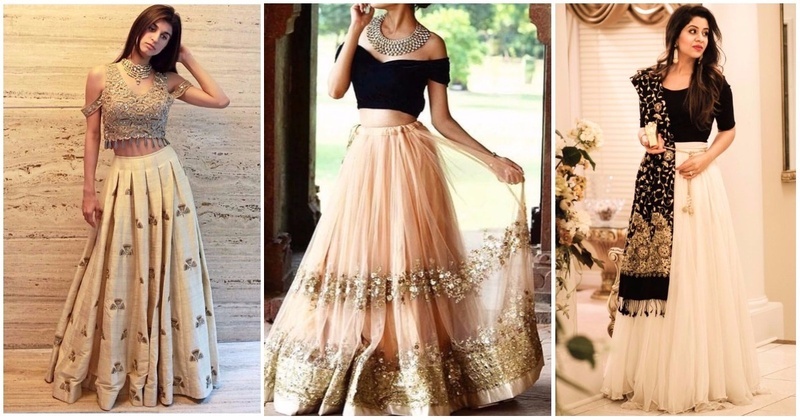 And while it started with easing out on the embroidery or going for lighter / brighter colours, Indian wedding lehengas now have a whole new look, especially if you’re a bridesmaid - crop tops as lehenga blouses! Sounds cool, doesn’t it? What we like about this style is that it meets midway between western fashion and Indian tradition, without having to compromise on either! 2. The Shirt Lehenga: Pair up a heavier lehenga skirt with a shirt of yours for a laid-back yet trendy look. From Alia to Dia Mirza and more, this one’s got all Bollywood biggies rocking it! 3. No crop-top? No problem! Just take any fitted top and tuck it in your lehenga skirt. Drape the dupatta so it looks more festive. Make sure that the top you’ve chosen actually goes well with the lehenga skirt. 4. Modern All The Way: What’s a lehenga? Literally a short top and a voluminous skirt! For the skirt, try playing with western prints or flowy/lighter fabrics like chiffon. For the blouse - I am in love with this black crop top with a criss-cross tie-up back! Fits in perfectly with those Indian blouse backs, except cooler and edgier. 6. Personal fav! I like how easy-to-wear and comfortable this T-shirt style blouse is. Knit fabrics/ stretchy, T-shirt fabrics actually work really well and are way too cool! Pair that plain blouse with a statement neckpiece or an embellished dupatta and you’re good to go.